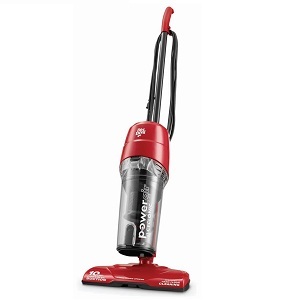 The Dirt Devil Corded Vacuum allows you to clean virtually any surface with its powerful 10 Amp motor. The compact, low-profile design allows you to vacuum even in tight and narrow corners easily, with its powerful suction sucking in any dirt or debris that the vacuum head can no longer reach. The long 20-feet cord gives you enough room to move around the room. With its unmatched suctioning power, compact and convenient design, and long power cord, you’ve got yourself a reliable dirt-buster. Having a powerful motor and a large dirt collection cup in place of a simple dust bag will inevitably add to the weight of the vacuum. Unfortunately, in order to reduce the overall weight of the Dirt Devil, components were created mostly out of lightweight plastic, which feels a bit flimsy compared to more expensive, heavy duty vacuum cleaners. It will withstand a couple of accidental falls caused by inappropriate storage, but heavier garage tools may have no problem punching through the plastic shell of the vacuum. The Dirt Devil electric broom relies on being constantly plugged into a socket, which means that it does not have to hold back in terms of power; the 10 amp motor easily picks up large stray coins and other heavy items that most cordless vacuums can only dream of picking up. The 11 inch cleaning path gives you a wide surface area for vacuuming, therefore picking up more dirt and debris without preventing you from cleaning tight spots and corners. Whether you plan on vacuuming bare floors or carpets, this vacuum’s rubber toothed strip dislodges most of the gunk on both surfaces easily. From cleaning the toughest surfaces to emptying the dirt collection cup to storing the vacuum for future use, the Dirt Devil corded vacuum provides you with unparalleled convenience. The large dirt collection cup means that you can vacuum for longer periods of time undisturbed, and because of the cup used in the place of a clunky bag, maintenance is a breeze. This vacuum also has a large O at the top of the handle, making it possible to hang this vacuum in your garage for quick and easy storage. With the inconspicuous design combined with unmatched suction power, everything becomes easier. 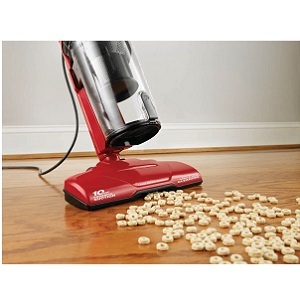 In terms of vertical clearance, with this broom vacuum’s 1.5-inch high vacuum head, you could easily slip under low-sitting furniture without a problem. In terms of the area allowance, while this vacuum is a corded model, which does, in a way, restrict your movement, the 20-feet cord allows you to vacuum around comfortably without having to switch sockets often. It probably won’t let you vacuum the upstairs balcony from the downstairs living room, but will allow you to vacuum freely in spacious rooms. Furthermore, the plastic wheels used in place of rubberized wheels allow you to vacuum in delicate surfaces without worrying about leaving rubber residue.